As associate dean for enrollment and student life, Townsend Plant oversees admissions, financial aid, the office of the registrar, and student affairs, developing a strategic and unified vision to attract the best students to Peabody and provide exceptional service from their recruitment throughout their time at the Conservatory. 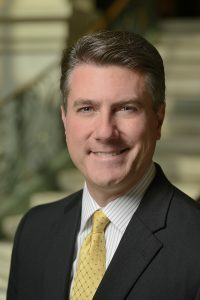 Since arriving at Peabody in 2015, Plant and his team have implemented a comprehensive strategic enrollment plan, developed enhanced scholarship opportunities, increased collaboration between faculty and admission staff in student recruitment, and implemented new systems designed to enhance recruitment and student retention. He is also the Peabody lead for the Johns Hopkins Student Services Excellence Initiative, a multi-year effort designed to enhance processes and implement new technology to support and ensure an optimal student experience across the University’s nine divisions. Previously assistant dean for admissions, summer and preparatory programs for the School of Music at Ithaca College, Plant’s prior experience includes roles as assistant provost for admissions and enrollment at Binghamton University, State University of New York, and director of admissions and financial aid for the Jacobs School of Music at Indiana University Bloomington. He is past chair of the Independent Consortium on College Admissions in Music, a national group comprising over twenty select music schools, and has served as a consultant in the areas of enrollment management, recruitment, marketing, and admissions in music. Throughout his career in higher education enrollment management and student services, Plant has focused on utilizing a strategic and data-informed approach to meet key student recruitment and retention goals, building important relationships with alumni and other key influencers to help students find the right school, and working collaboratively with faculty and staff to ensure students have the tools and support to meet their personal and professional aspirations. A classical guitarist, Plant graduated with Bachelor of Music and Master of Music degrees from Ithaca College and completed a Doctor of Musical Arts from the Eastman School of Music of the University of Rochester.